My Little Free Library! For those that follow my blog's Facebook page, you know I have been working since the beginning of the year to bring a Little Free Library to my local community of Latimer, Iowa. I've had to do some work to make this possible and after receiving the Little Free Library, it made it all more a reality! My love for my community and passion for childhood literacy is what drove me to set up a Little Free Library in the community of Latimer. Reading is really important to me and raising my kids. My kids and I read every day and always have books around. The town of Latimer doesn't have a library and I know there are many kids in town that don't have an opportunity to go to a library, especially in the summer. So I thought bringing a Little Free Library to Latimer would be great for all the youth of the community, and for the adults who love to read too. So how does it work? After working with the Latimer City Council, I will now be installing the Little Free Library in Downtown Latimer sometime in the next month or so. I got approval from the Council to use city property for the Little Free Library at their February meeting. The Little Free Library will be open 24 hours a day, 7 days a week and 365 days a year. It will be filled with a collection of books for both children and adults. The Little Free Library works by the "take a book, leave a book" philosophy. When someone goes to the Library and picks out a book, they are asked to replace it with another book. The Little Free Library movement began in Wisconsin five years ago and now has nearly 12,000 locations world-wide, over 100 of which are in Iowa. I first read about Little Free Libraries through the "Parade" insert in our newspaper a few years ago and in the last couple of years I have started seeing them in the communities of a couple of my family members. After finding out about an opportunity with Post Alpha-Bits cereal where I could apply to receive a Little Free Library and a starter book collection through them, I then put my love and passion together with this opportunity and decided that I should bring a Little Free Library to my local community. How can you help? I am still looking for some adult books to help fill the Little Free Library. If you have any good, gently used books you are willing to share with the Library let me know! I'd love to add them to our collection. Also, I am planning on putting together a "ground breaking" party for the Little Free Library after it is installed. I hope the Little Free Library is a resource for all the Latimer community and that it helps them connect with a neighbor they maybe wouldn't have met otherwise. Peel and split banana lengthwise. Place in sundae dish or cereal bowl. Top with yogurt. 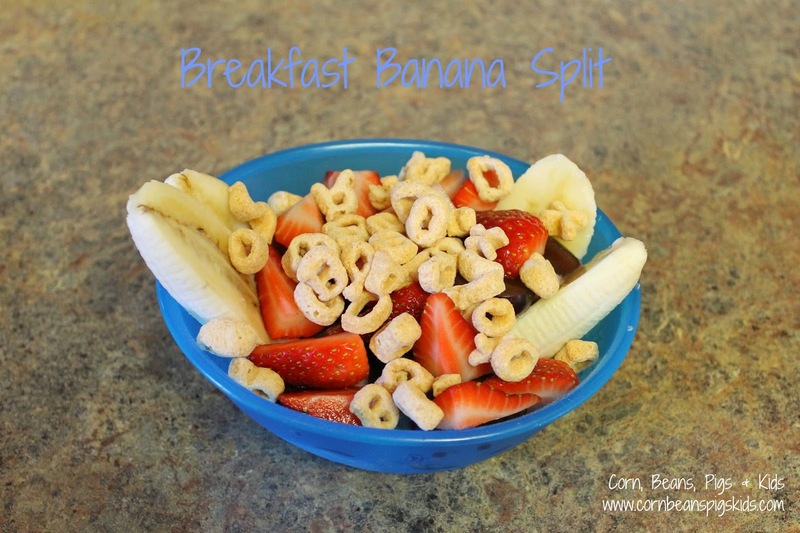 Sprinkle with fruit and cereal. Makes 1 serving. Do you have a Little Free Library in your community? Remember to Comment for a Cause! I am so excited about your LFL!! You are doing such a great thing for your community and it is going to be a huge hit!!! I might be able to come up with a couple books for you to include!!! Just saying…..I have a few! Keep us posted on all of the details!!! That would be great Beth Ann - I would appreciate some books! This is a awesome. I saw this idea on the news a few months ago. I would love to send you a few books. Can you email me your address at crystalcattleblog@gmail.com. This is a really awesome thing you are doing for your community. Thanks Crystal! I'll send you my address! I love these things! They had a great footing in Athens and really cutely decorated libraries in several locations! Unfortunately, I don't have many entertaining books for adults (only academic books), but a thought as you are nearing garage sale season you may be able to get some good deals (maybe even from the free piles) or even goodwill. Just a thought! Hope to catch up with you soon! Thanks Melissa! I hope to have the library up and going before garage sale season but will definitely check them out throughout the summer for some new books to add to the collection. Hope you are doing well! Congrats on the arrival of your library. It's wonderful you are doing this for your community. I might have a book or two I could donate. That would be great Jeni! I love how excited my community is getting for the library. Thanks Kelli! I know the adults of the community are excited for the Little Free Library - I hope my other target audience of "kids on bikes" is excited too! Congrats! Shoot me an email the next time you are coming to the office, I am sure I have a couple of books that you can have for the library. Matt & Veronica are into Divergence books, Hunger Games, and that type of book. I can hardly keep new books around fast enough for them :-) (And yes, they do also use our local library too!) So cool! I live by the saying "Bloom where you are planted." I am proud to be a farmer, farmer's wife and stay at home mom. Combine that passion with my love for my community and volunteering, there always seems to be "fields of opportunities" for me and my family in rural North Iowa.